Do you often find yourself struggling to be productive while working in your home office or at your desk at work? Perhaps you have an issue focusing on the task at hand or you often become distracted by the various interruptions that can occur when you are trying to get important work done. Having a desk piled sky high with paperwork galore that’s just glaring at you is a recipe for feeling completely overwhelmed. And while having cute little trinkets lined up all along the backside of your desk can be fun, it’s also easy to let yourself become distracted by them. Try to keep your desk and general office space as clutter-free as possible so that you are able to focus more on work and less on your surroundings. Consider displaying just a handful of pictures in your workspace that include your family and friends, and maybe a motivational quote as well. 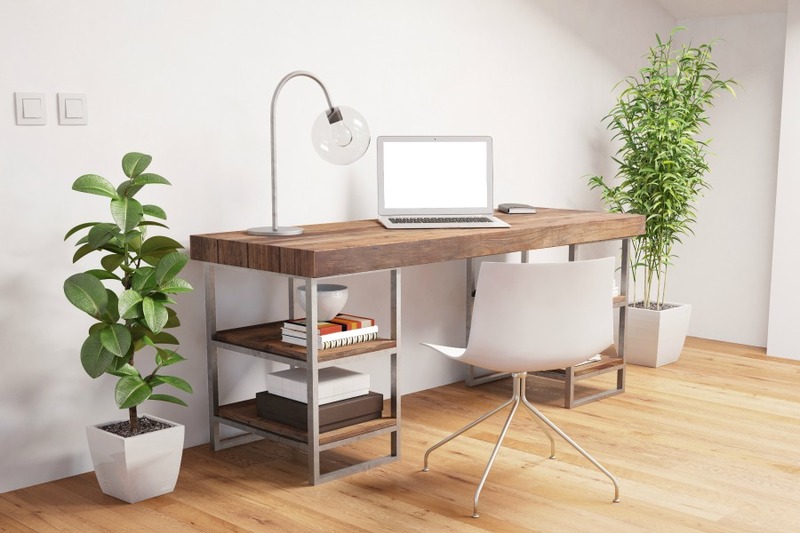 Your desk doesn’t have to be completely sparse, just make sure that the amount of decor you have isn’t impeding your ability to get things done. If you are struggling with the amount of paperwork or to-do lists that you have all over, consider going digital to reduce the amount of paperwork you constantly need to sort through. While I’m a fan of having a paper to-do list to keep me on track everyday, I recently made the switch to going paperless with everything else (with the exception of things like our social security cards and birth certificates). I used The Paperless Home as a resource to walk me step-by-step through the process of going paperless and it was much more simple than I imagined it would be. Going paperless is definitely worth trying if you want to eliminate the paper clutter in your life for good so that you’re not just continually re-organizing and sorting paperwork every few weeks. Evernote – I keep everything from work documents to the PDF versions of manuals for home appliances stored in Evernote. Not only does it eliminate paper clutter around my office and the rest of my home, but it also makes it quick and easy for me to find the documents I need within a few seconds. 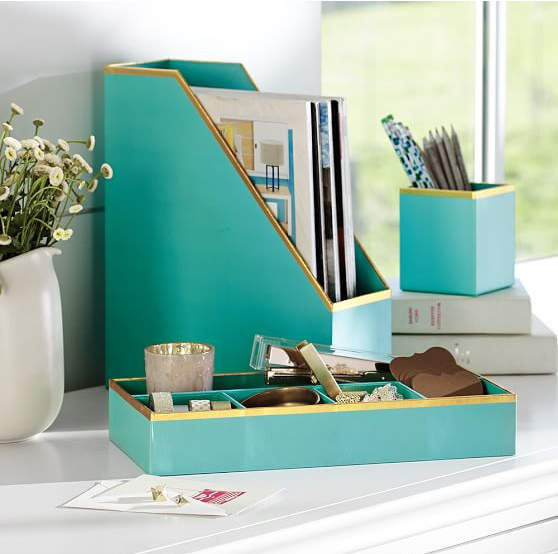 No more rifling through piles of papers or filing cabinets to find things! A super nice feature they offer is that they have a free app for your smart phone, so you can access documents or keep track of your notes while on the go. It’s my favorite app by far! When I worked in an office, we used Office Plant Hire to make the office feel more homely, and it definitely made a difference to the whole team! Document Scanner – Having a good quality scanner at home does wonders for being able to digitize all of your paper documents. Especially for things like signed contracts, manuals, etc. The Paperless Home – This resource walks you step-by-step through the process of going paperless and shows you exactly how to use Evernote to organize your life. For me, it made the transition so much easier and less time consuming than if I had tried to figure it all out on my own. It’s so important to be comfortable while you’re working! Investing in things like an ergonomic desk chair are so worth it when it comes to staying ache and pain free while working from a desk. I have an ergonomic office chair, and an exercise ball that I sit on from time to time. It’s a perfect way to engage your core and practice good posture while you’re also getting work done. I use a MacBook laptop, and recently found myself getting a strained neck from looking down at the screen so often…not good! So for Christmas, my sweet hubby gave me an awesome stand to put my laptop on, as well as a wireless keyboard and track pad (all pictured below). It is amazing!! I still can’t believe what a difference it makes in my comfort level while sitting at my desk. If your budget allows for it, please invest in items that will help you create a more ergonomic workspace so you can be more comfortable while sitting at your desk. It makes a world of difference over long periods of time, and your body will thank you for it later! When I shared my habits that help me to be productive when working from home, I mentioned how my favorite noise-cancelling headphones really help me to stay focused on the task at hand. While they cost a pretty penny (they were a gift from my hubby over 5 years ago….he is really good at presents 😉 ), they are seriously the gift that keeps on giving. We have a ranch style home that isn’t that big, so if the hubs is watching Little Miss for a bit while I get some work done, it’s crucial that I have my headphones on if I want to get anything accomplished. I’m pretty sensitive to noise and found these headphones to be a godsend when I was still working in an office environment too. Harvest – I use this time tracking tool to keep track of how much time I spend on specific tasks. It’s great to see exactly where my time is going so that I can streamline a bit more and find new ways that I can work more efficiently. RescueTime – This is also a great tool to use that you install onto your computer, and it tracks how much time you spend in specific programs and then sends you a report to let you know where your time is going. This is a wonderful solution if you find yourself wasting time on things like YouTube or Facebook while working. While I think that simplicity is key when it comes to keeping a workspace an efficient place to get things done, I am also a firm believer in making work fun. Sometimes having pretty notepads, awesome pens, and beautiful binders makes sitting down to work at your desk a little bit sweeter 🙂 . I’m a huge fan of having a notepad sitting on my desk that I can quickly jot my random thoughts into as I’m working so I don’t forget them. My favorite place to pick up super inexpensive, yet cute notepads is actually in the Target dollar spot. They always have a great selection to choose from! Adding simple items of decor to your workspace can also add some coziness while keeping the clutter at bay. Some fun and easy decor ideas might be a small succulent (apparently they make fake ones too if you are like me and can’t keep a plant alive to save your soul) or a cute pencil cup to keep your writing utensils handy. It can also be helpful to display something that serves as a reminder for why you do the work you do. Maybe a picture of your family, a favorite destination you love to travel to, or a memento of something that is important to you. Having those small reminders around can be a great way to give you some peace of mind when you are having a rough day. It’s always great when you can minimize the amount of times you need to get up from your desk to quickly grab something you need. Having small interruptions like this can cause you to lose a lot of focus and then you likely waste even more time trying to get back into a productive state of mind. A good solution to this is keeping all of your “essentials” right at your desk, even if that means needing to buy multiples of these items so that you don’t need to waste time trying to figure out where they are at. What are your favorite ways to make your workspace a place that helps you to be productive and that you enjoy spending time in? Share with me below! P.S. Don’t forget to sign up for my Simplify Course below if you haven’t yet! There are affiliate links in this post. If you choose to make a purchase, I will receive a small commission at no additional cost to you. I only recommend products that I love myself and that I think would benefit you too. Thank you for helping to support Embracing Simple in this way! Thank you so much Sarah! Sometimes I like to work on the couch too if I have some easier tasks to work on at night, but I do find that I’m so much more productive when I’m sitting at my desk. Especially for tasks like writing! Christina, I love this so much! 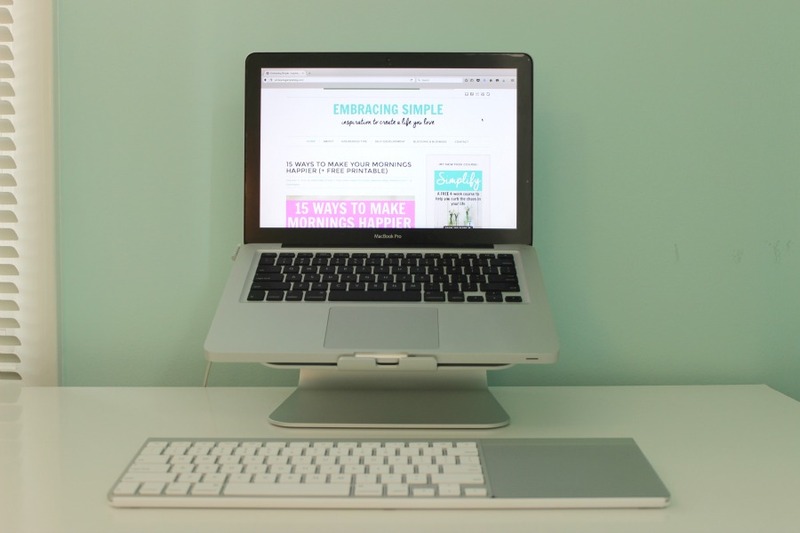 Keeping a desk clean is so important to being able to focus and feel less stressed. I’ve been thinking about getting into oils– people seem to love them– and using them as a way to set the mood at home. I’m working on my home office now. I’ll have to include these tips. I really like the oil diffuser tip! Since I spend most of my day and night in my home-office I make sure it’s decorated with my favorite things like candles, pictures and of course my office supply accessories to keep me fueled up and motivated for the day. Thanks for sharing these tips with us. I hope you had a great week! What great tips! I am thinking of getting something for my laptop too because my neck gets strained. I love having a plant or something green within my view. It helps me feel more at ease and more cozy which helps me to focus and get things done. That stand is awesome!! I work on my iPad a lot, occasionally on our Mac computer but I do feel like I need something for the iPad to be at eye level too. Awesome gift! These tips are really great, thanks! 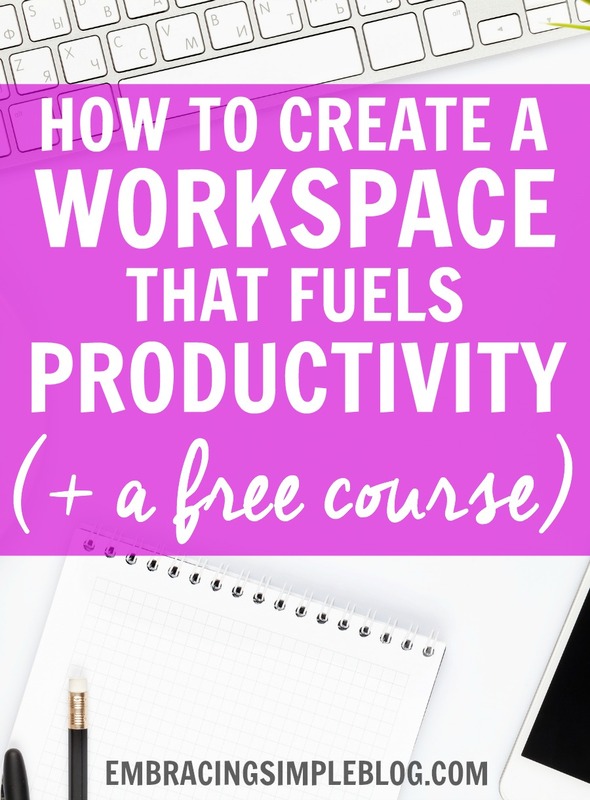 I need to create a workspace like yours. Unfortunately, my desk is the catch-all for just about everything and I end up working on the couch! My goal this week is to get it organized. BTW, I went through your Simplify Course and really enjoyed the section about technology. I’ve cut back on my social media use this year and am really enjoying a break from it all. Thanks for sharing the course with your readers! Emily, yes definitely take the time to organize it all. My desk can become a catch-all too very easily since we don’t have a huge house and it’s the only surface that doesn’t get seen by guests hah. I always feel so much better when I clear it all off and make it my own oasis spot 🙂 I’m so glad to hear you enjoyed the course, that makes my heart happy!! So helpful, Christina! I’m supposed to be working now, but I was on facebook 🙁 –but thank goodness I was because this is just the kick in the pants I needed. My desk is atrocious, and I need to shut down the extra tabs when I’m working! Love your space–I’m inspired!! Hi,I check your blog named “Twitter” on a regular basis.Your humoristic style is awesome, keep it up! And you can look our website about free ip proxy.